These meters are heavy and sturdy meters. These type of Portable Ammeters and voltmeters are designed for use in the field test rooms and laboratories, where precise measurement is required. These portable Instruments can be used equally well in educational institutions, where there is possible misuse; and in factories, where these instruments are important for making calibration check on switchboard panel instruments. These are manufactured under rigid quality control to ensure stable performance and durability. - Knife edge pointer and Anti-parallax mirror scale. - Shock resistant pivot jewel movement. The pivots are made from carbon steel hard chrome plated and are mounted on spring loaded sapphire jewels. This ensures shock resistance due to vibrations in transit and minimum friction during use. - Wooden case with Bakelite Top. - Wide window for easy reading. - Quick response due to unique damping. - Insulation Resistance Over 20 megaohms at 500 VDC. - Sensitivity 1000 ohms/V for DC Meters.- Test Voltage 2000V AC (rms)for 1 minute. These are available in moving iron & moving coil type. Class 1.0 (1% of full scale value) as per IS:1248 between 10%-100% of scale. Class 1.0 ( 1% of full scale value) as per IS:1248 between 15%-100% of scale. Class 2.5 (2.5% of full scale value) as per IS:1248 between 25%-100% of scale. PORTABLE POW> +/-3 degree (Electrical) as per IS:1248 for power factor meters. +/-1.0% of full scale value as per IS:1248 between 10%-100% of the scale for single phase (Unity Power factor) UPF wattmeters. +/-1.5% of full scale value as per IS:1248 for Three phase watt-meters. +/-1.5% of full scale value as per IS: 1248 for 0.2 PF (LPF) single phase wattmeters. It houses SO65/MO65(round series) model generally used in educational purpose. These meters have accuracy of 2.5%. And available in variants of single and double range. It houses AC65(R)/DC65(R) (phoenix series) model generally used in educational purpose. These meters have accuracy of 2.5%. 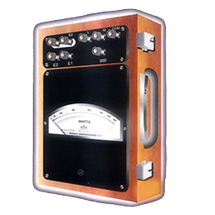 These meters can be provided with upto 5 ranges in a single meter.